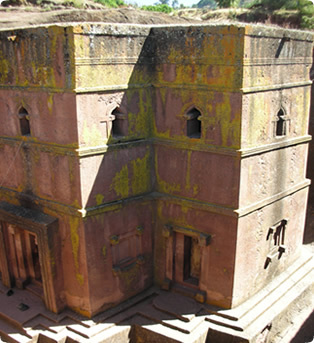 Also known as ‘Africa’s Petra’,lallibela and it rock-hewn are arguably ethiopia’s top attraction. It was built in order to become ‘new Ethiopian Jerusalem’ stay away from the travel of Ethiopian pilgrimages to Jerusalem. Together with axum, the second important holy city lallibela is founded during the zagwe dynasty around the fall of the Axumite Empire in the 13th century. The rock-hewn churches of lallibela are characterized by its eleven churches curved out of the pink granite rock of the mountain. The churches are divided into to groups according to their location with respect to their river Jordan and are connected to each other by means of narrow underground passages. Each church has its own unique architectural style, all are superbly sculpted and most are decorated with well-preserved paintings.